Please note: The Heritage Gallery closes over the Easter Weekend, from Friday 19 to Monday 22 April inclusive and is closed for the Monday 6 May Bank Holiday. The Heritage Gallery is otherwise open Monday – Saturday 10-5. In the Undercroft to Queen Anne’s Court at the Old Royal Naval College lies a collection of stone heads from the turn of the 18th century. 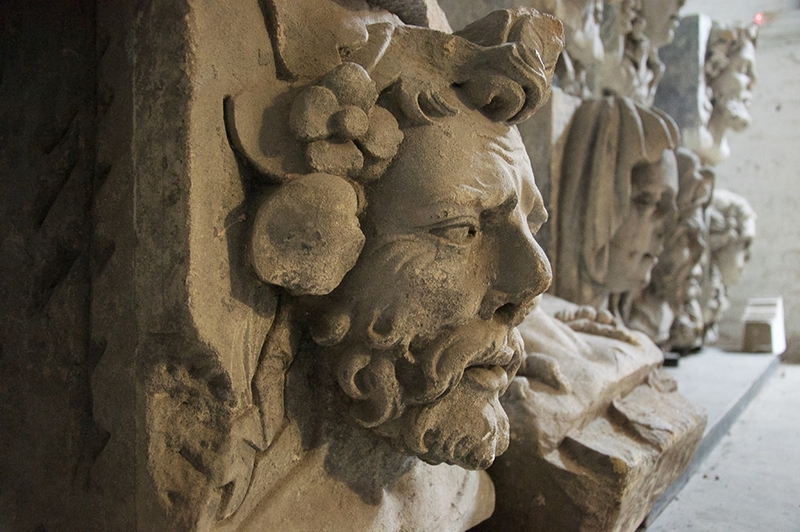 The mysterious heads, depicting Neptune and other denizens of the deep, were carved by Robert Jones of Stepney in the early 1700s and were originally intended for display upon the south elevation of the Painted Hall. A decision to use brick instead of stone meant the heads were abandoned, and for 300 years have languished out of sight. About the Heads is an exhibition at the University of Greenwich’ Heritage Gallery to rescue them from obscurity, coinciding with the re-opening of the painted hall after a major restoration. The heads themselves are not on display; instead, three artists from separate disciplines have created responses to their historic and continuing internment. Camilla Wilson reveals the heads through a set of monochrome orange paintings. Like the process of stone carving, the paintings are made by removing paint, rather than by adding; the orange colour referencing the floating hue of retinal afterimages. Rosie Dastgir activates a dialogue between the abandoned heads in the format of an 18th-century chapbook, the cheap illustrated booklets of street literature of the time. Jürgen Mester has produced four sculptures in a range of materials that reflect his distinct version of the heads.